I am an artist living in Cork City in the south of Ireland. 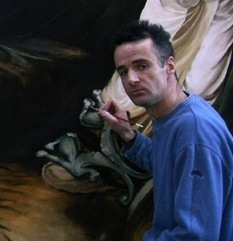 I produce original figurative paintings and reproductions of dramatic classical and period art. I also create mosaics, polished concrete countertops and patios. I build award winning, hand painted signs. I work on a commission basis and can develop dynamic original figurative paintings, abstract art and portraits after outline discussions with my client and access to an appropriate selection of photographs. Portraits usually take two to six weeks to complete. I reproduce fine art paintings from many art periods. These paintings work equally well in domestic and commercial settings, and can be painted in any size and can also be fitted to panels to provide greater durability in difficult environments. My murals and trompe l’œil effects can provide sophisticated and unique qualities to any area, emphasise attractive elements, give featureless spaces character and hide or disguise inferior features. Murals can be painted on canvas in studio to my clients satisfaction before being transported to the hanging location. The canvas is then mounted on site to wall or ceiling accordingly. The unique installation process was developed to minimise any inconvenience to my clients. The murals can also to painted on site if required. I work with my client or with architects and interior designers to develop design ideas and I am committed to achieving a perfect result every time. I build polished concrete countertops and patios incorporating coloured aggregates, fossils and pigments. Polished concrete is economical to use and can transform any tired back yard or patio area. It is versatile and can be built in forms of any shape or size. It is extremely durable and always unique. Patio surfaces must be built in-situ, countertops can be built off site and fitted on completion. I design and build original hand painted signs using both traditional and modern methods. I can incorporate dynamic images and lettering into double sided hanging signs, fascias and large format banners. My signs have won Shop Front of the Year Award on several occasions. Address: 39 Quaker Road, Cork, Ireland.